Tecno has added two new devices to its Camon flagship devices, the Camon CX and CX Air. this is an upgrade of the 2016 first 13MP front smartphone, the Camon C9. 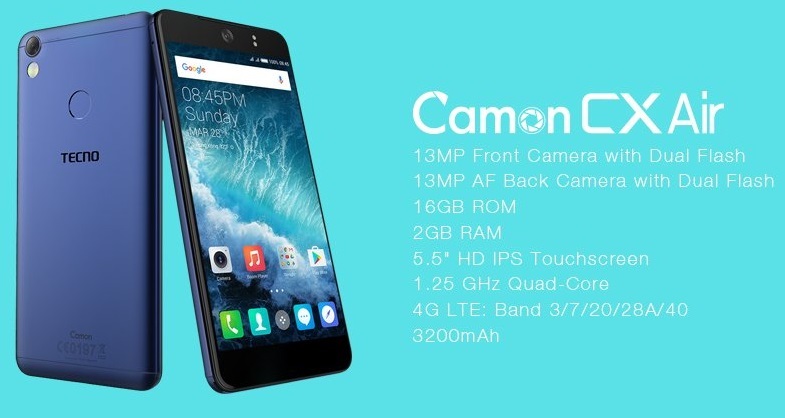 The Tecno Camon CX Air is the lower version of the Camon CX, though it still has a promising specs and features. Tecno Camon CX Air is one of the latest 2017 Tecno smartphones, a member of Tecno’s Camon C Series family, the CX Air offers a closed spec to the Camon CX, runs on Android 7.0 and is powered by a MediaTek, bt the the Octa core chipset was stepped down to 1.2GHz. The device sports a 5.5-inch display with 1080 x 1920 pixels resolution. This puts it at the same size and pixel density as its predecessor. The love of Camera and photography has always been the strength of the Camon series and here, Tecno has stepped it to a 16 megapixels camera both front and back. Tecno Camon CX Airruns Android 7.0 (Nougat) on the 1.2GHz octa-core Mediatek chipset. with a 2GB RAM size and 16GB internal storage. The storage can be expanded with a dedicated MicroSD card expansion slot upto 128GB. Also, it has a fast fingerprint sensor that unlocks your phone in as little as 0.1 second and supports 4G LTE for super fast internet browsing. The Camon CX is however a really good smartphone. But, the 3200mAh Battery Capacity (supports fast charge), is something we are not comfortable with. I just wished it was a little higher than that.